Thank you for developing a toilet that, when flushed, instantly sounds like a jet breaking the sound barrier. Thank you for adding a year to potty training. Thank you for scaring a year off my kid’s life. Thank you for teaching my kid that all of my reassurances that “it’s safe” have been lies. You’ve probably guessed that my toddler son, Lucas, and I had a run in with one of these. If so, you’ve guessed correctly. I’m not talking about a “row, row, row your boat” whirlpool of a toilet. This was the kind that seems capable of sucking little kids and half the known universe into its roaring porcelain mouth. My son doesn’t care for loud sounds or being sucked into bathroom fixtures. I could say that it scared the s##t out of him, but it probably scared it into him. Forever. At least for a really long, forever-seeming while. So, thanks, public toilet designer! And by thanks, I of course mean that I hope your car catches fire on its way off a cliff that forms the edge of a landfill loaded only with dirty diapers. Learn much lots faster and more bettererly. Liking our Facebook Page is pretty rad. And it won’t devastate your kid’s potty training progress. We haven’t gotten past pregnant yet (26w), but am following your blog. One more thing to thank the public toilet designer for – removing the lid and allowing us to be sprayed by lovely, lovely, aerosol. Great on a hot day that misty blast eh? I’ll shut up now. Good idea. We’re doing the little plastic portable potty with good success. He’s alright, at least he’s not upset by them because we keep him away from them. I went through that with my daughter. I learned the trick of hanging toilet paper over the sensor to keep it from flushing, but even then, she didn’t trust me. Even at 6 years old she sits on public toilets like she is ready to sprint off at any sign of it flushing. Thank goodness my son could care less if it flushes while he is on it. +1 to the post-it note idea. My daughter is convinced that those toilets have an “evil eye” that tries to flush her down the toilet if she is not vigilant. But worse than that, I think, are the airplane toilets that literally do sound capable of sucking one through the toilet and ejecting one into the vacuum of outer space. After a recent epic train/plane vacation that we just came back from, my 3-year-old is more happy to just finish going potty and then let me flush the toilet with her safely outside. I want to know what it takes to get one of those toilets installed at HOME! I’d really like to go & not worry about needing the plunger. Ever. TheBoy is going to need therapy for so many reason, so toilet trauma is low on the priority concern list. Those things are no joke! We had one at work that would not only flush like a black hole, it also shot water ALL OVER THE PLACE. If you leaned forward too much it would flush while you were still sitting there and that was NEVER cool. Also, the light in that bathroom flickered in a very horror movie way. Worst bathroom ever. Ha! I thought I invented the sticky note trick for my first child. Those automatic flushing toilets really freaked him out. Never leave home without sticky notes! Worked like a charm. My two year old still isn’t too interested in going potty on the toilet. Except at random times and random public potties more often then at home. Like the other day at the park he decided he wanted to go potty. The loud flushing doesn’t seem to scare him too much so I guess that’s good, but we haven’t had to deal with the automatic ones going off while he’s on one so we will see. I really don’t understand why he would rather go on the potty at a park or rest stop but not at home? Reminds me of this scene from Look Who’s Talking. Oh poor kid! Those things can be freaky! I’d also like to thank them for the seats with the gap front and center. I have to put my kid on the potty side saddle. I was flying with a three year old girl who was scared of the toilet last year through the (Denver? Dallas? Vegas?) I-don’t-remember airport, and the autoflushing toilet wouldn’t stop auto flushing underneath her because she was too tiny to make it register what was happening properly, I was helping her not fall in to the ENORMOUS bowl, and every time I moved, it was interpreting that as time to make the horrendous sucking noise. She cried hard for a good five minutes. You can thank low-flow high-velocity toilet designers trying to save the world’s water for future use for this innovation. it’s a noble thought, but hey designer guy: If it flushes ten times before I leave the stall, it is NOT saving water anymore. You’re terrifying small children while defeating your own purpose. I am a frequent censor blocker for our family, same issue a VERY loud toilet created some very real fears in our 5 year old child. One time it wasn’t block, my kid literally leaped off the thing (thank goodness was already done their business). 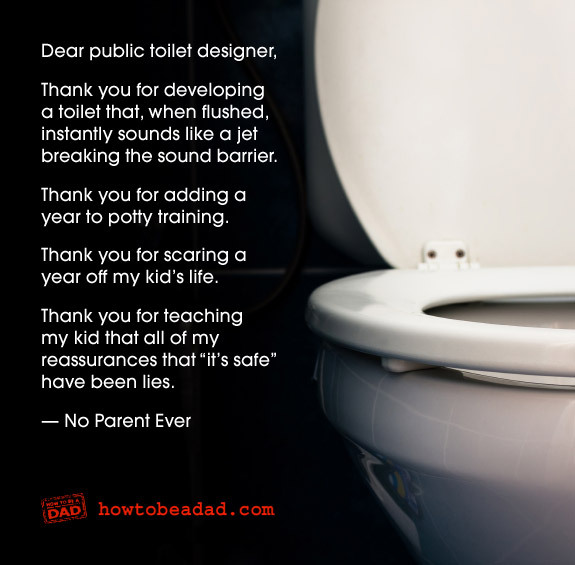 Public bathrooms have been a pain for some time now and our kid still has concerns over the auto flushers and won’t use them by themselves. Thank goodness the one’s at school were manual! I’d also like to thank Dyson for the airblade hand dryer. It sounds like machiary used to cut armor plating for army tanks. Unlike the sticky note suggestion, there’s nothing to forget! well played, good sir, well played indeed. So sorry to hear this. We have old-fashioned city toilets (no tank) that sound like this, and our son often runs from the room with his hands over his ears after flushing. For a good laugh on toilet training, check out the children’s book “Bertil and the Bathroom Elephants” — a truly bizarre tale.